To do this stretch of trail as a one-way trip, you'll need to set up a shuttle. A 4WD Vehicle is highly recommended for this trip. To leave the first vehicle at Walupt Lake, take Interstate 5 north 75 miles and take Exit 68 onto US-12 toward Morton and Yakima. Take US-12 east, 61.6 miles and turn right onto gravel-surfaced Forest Service Road #21. Follow FS21 15.6 miles to a sharp left onto Forest Service Road #2160. After 4.4 miles, you'll reach Walupt Lake Campground. Drive around a bit and you'll see the trailhead. Make sure to have a forest pass to leave your vehicle here. Hop in the second vehicle, and head back out 4.4 miles to a right turn onto FS21, and after 15.6 miles, a right turn back onto US-12. Take US-12 east for 30 miles (watch out for the flea market in Packwood on Labor Day, it gets packed) to Tieton Road. Take a slight right and then after 0.2 miles a slight left onto Tieton Reservoir Road. Continue 2.8 miles until the road becomes Forest Road #1207, and another 1.5 miles until the road dead-ends at the tiny North Fork Campground. You can leave your vehicle here at the trailhead. There are restroom facilities here next to Scatter Creek. The majority of hikers take the Goat Rocks Crest from White Pass to Walupt Lake, as described in the guidebook, but we opted to cut out five pretty brutal miles of trail and stay the night at beautiful McCall Basin instead. We only had three days to do this trip, so we thought that 30 miles was a bit much for four out-of-shape weekend warriors with heavy gear on a trail that steep. Many people will be frustrated with all the sharp ups and downs of this trail, as it drops into valleys and climbs into peaks with relentless frequency. The first day of hiking from North Fork to McCall Basin is pretty uneventful. The grades are moderate, the scenery is fir forest, and there are a few creeks to cross. Views are scarce on this stretch of trail, but yellowjackets aren't. Take Trail 1118 from the North Fork campground at Scatter Creek for 1.4 miles to a junction with Hidden Spring Trail #1117. 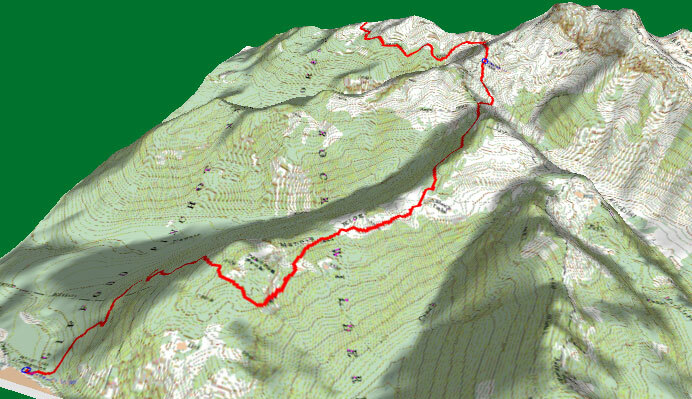 Continue straight on 1118 for 3.2 miles to Tieton Pass and an intersection with the Pacific Crest Trail. From here, take a left onto the PCT and pass Lutz Lake at about 0.8 miles and another 0.5 miles to the intersection with trail #1151. Take a left and drop down into McCall Basin for a smorgasbord of excellent campsites and fresh water from the North Fork of the Tieton River near McCall Basin Falls. You won't get much of a glimpse of the falls, as it drops through a steep canyon and is mostly obscured by trees, but the rushing water still provides a soothing backdrop to lull you to sleep under the star-studded sky. You'll need a good night's sleep for tomorrow's hike, so get to bed early! The second day is by far the most grueling stretch of trail on this trip. Make sure to stock up with water, because there is no more water until you get to Snowgrass Flats, more than 12 miles down the trail, and this stretch can be brutal. If the weather is anything less than stellar, don't even think of trying it. The winds can howl through the peaks near Old Snowy at speeds well over 50mph, and the trail is narrow and exposed. Make sure to have cold weather and rain gear at all times of the year as you make your way past the Packwood Glacier toward Snowgrass. Trekking poles are a great idea here for stability, and if you see a horse party coming the other way, make sure to get out of their way as soon as possible, because there is not room for you both on the trail, and turnouts are few and far between. This is the highest and most dangerous stretch of the Pacific Crest Trail in Washington, nearing 8,000 feet. The trail turns from dirt to shale before turning to sand on the other side of the peak. This is also the most spectacular stretch of the PCT perhaps in its entirety. The views of Mt. Rainier, Mt. Adams, and Mt. St. Helens are constant on a sunny day, and the Goat Rocks loom large everywhere you turn. Looking downward, you see Packwood Lake, with Mt. Rainier looming over, and Goat Lake with Mt. St. Helens keeping watch. Mountain goats often dot the steep slopes, and the sunset over Mount Rainier is breathtaking. As you leave McCall Basin (you should head out before sunrise), take a left back onto the PCT, dropping sharply into a beautiful basin with some excellent lunch spots and campsites and a small creek. There are trails cut up above, for those who wanted to cut out the descent and subsequent climb, but they are blocked off by the Forest Service. You are now at the foot of the major obstacle of this trip. Your first fantastic views of Mt. Rainier are apparent, and you're possessed to stop and take some photos. When you're finished, the climb up to Elk Pass at 6400 feet (4.5 miles from the McCall Basin trail) begins. Here is where you make your decision as to whether to attempt this stretch. If it is windy, rainy, or snowy, don't even try it. You'll be sorry. If the weather holds, head up the trail 4.5 miles or so to a crossing of Packwood Glacier. It can be icy here, so be careful. It's a long way down. Here you can scramble up to 7930-foot Old Snowy, the highest peak in the Goat Rocks if you're up to it. Otherwise, you can continue on along the shale trail to a select few wind shelters set up to block weary hikers from the brutal gusts that can take place up here at night. You may want to continue past here if it's not too dark, and find a campsite near Snowgrass Flat (about 4.5 miles past Packwood Glacier), which at times is closed to camping (but you can camp nearby). There are a couple of streams here to fill up with water, but they tend to go dry during the late summer. Take a right on trail #96 for 0.5 miles to an intersection with trail #86. There is a stream nearby. The third day presents you with more steep climbing up to Cispus Pass at 6872 feet, after dropping into beautiful Cispus Basin. Cispus Basin makes you want to burst out into "The Sound of Music" with it's luscious green meadows, waterfalls, and wonderful views of Mt. Adams. Cispus Pass affords more excellent views, as you work your way down 4.4 miles to Sheep Lake at 5710 feet. You may want to take a dip here on a hot day, or just sit in the shade and enjoy lunch. Hook up here with the woodsy Nannie Ridge trail #98 and climb upward yet again past two small lakes to Nannie Peak at 6106 feet. After you peak out, your knees are in for a beating as you finish out the 4.5 mile stretch of trail with some brutally steep downhill, with no views, no water, just relentless switchbacks. Setting up the shuttle took a long time, since Tom only had a Pontiac Sunfire to drive up the washboard gravel road, and when we drove through Packwood, there was the annual Labor Day flea market going on, so the town was absolutely packed. We finally made it to the trailhead, and had hardly started up the trail from North Fork Campground when I was stung by a yellowjacket. An ominous start, I thought. The yellowjackets were our constant companions throughout the trip, making Sandra quite crabby. It might have been our stash of Cosmopolitans and Martinis that they were attracted to? After climbing steadily through the woods, we turned off and dropped down into McCall Basin to make camp for the night. The sky was beautifully clear, making for some wonderful stargazing. We found a site right by the creek, where we filled up with water, washed up, and ate. After dinner and martinis, we were all exhausted, and went right to sleep. The next morning, we hunted down McCall Falls, which was hidden behind trees down in a ravine. We stopped for lunch just before climbing to Elk Pass, in the shadow of Mt. Rainier, in a lush meadow with a small creek passing through it. We lounged for a little too long, however, as we found out at the end of this day. We headed up to the pass, where there was still snow in late September, and climbed the steep, exposed dirt (then shale) trail up to Packwood Glacier. There were some pretty hairy spots, where your heart got pumping as you climbed up a rock face with sheer exposure below you. It was all worth it, though, as we took in the panoramas all around us, with the Goat Rocks ever-present, and Mt. St. Helens, Mt. Adams, and Mt. Rainier all around us. A mountain goat rested in the meadow just below the trail, and the views stretched for hundreds of miles in all directions. It was truly majestic (too bad we were so exhausted that it was difficult to enjoy it!). The temperature was about 90°F, just perfect with the 20mph glacial breeze that blew the entire time, and there wasn't a cloud in the sky. The glacier was icy, but we plowed through okay. We ran out of water about here, which was no fun, but we pushed on past the wind shelters to our planned campsite near Snowgrass Flat. It was getting dark when we got there, and we found out that Snowgrass was closed to camping. We also found that all the streams were dry. Not cool. We finally found a trickle where the few droplets that were getting by were pooling in a certain spot. With a water filter, we were able to siphon enough water up to cook and replenish our supply. Our campsite was perched on a hillside with a magnificent view of Mt. Adams, where we got bombed by Gabe's dehydrated-food gas until the wee hours. The next day, we dropped down into Cispus Basin, which was like a scene out of the Elven Nation in The Lord of the Rings. Waterfalls drained through the lush, green valley, and we longed to just stay and lounge. However, this s was our final day, and we had to push on. We took in some great views of Mt. St. Helens and Mt. Adams from Cispus Pass, and dropped down to a series of small lakes suitable for swimming. The views pretty much died out here (we almost did too, thanks to Gabe's stomach), as we dove into the woods and headed to Sheep Lake for lunch. After lunch, we climbed up to Nannie Ridge, and dropped sharply down through a relentless series of switchbacks to Walupt Lake. Gabe and Tom went for a dip in the lake at the end of the trip, as Sandra and I packed everything into the car. Our knees were beaten into submission, and Sandra's little short legs were shot. Our 50lb. plus packs were just way too heavy for this trip. Gabe and Tom with their 25-30lb. packs were thinking life was good, however. This trail was a fabulous experience, and we were all happy we had done it. Just writing this makes me want to go back! Next time, we'll just drop some weight (no, not the cosmos...).